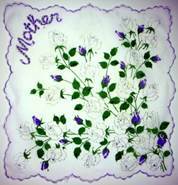 Two little words – Mother’s Day, evoke the deepest of emotions and strongest of memories in every child, of every age, in every part of the world. While things like mother’s day gift baskets can make the day even sweeter, Mother’s Day is all about appreciation and gratitude. Whether your mother is still with you or has passed, whether she abides close by or across the seas, your mother is the one and only relationship you’ve had since before you were born, that will remain with you until your final day. So many books, poems, and tributes have been dedicated to Mothers, it would be impossible to capture the range, breadth and depth of our love for them. 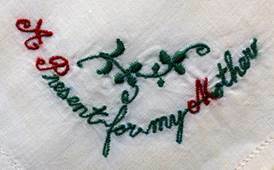 Instead, I can simply share a few tokens of affection – one hankie found in a keepsake box, alongside a baby rattle and lock of hair; one found enveloped by a child’s homemade Valentine, thick with glue and glitter. 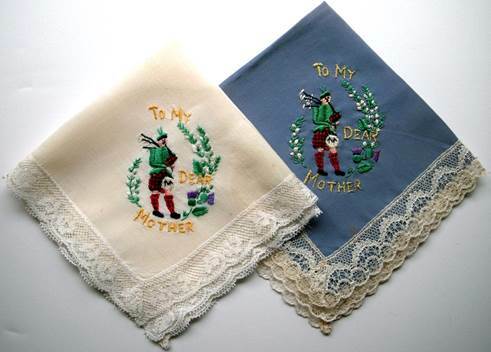 One handkerchief, a father informed his son, his mother slept with under her pillow every night, and carried against her bosom every day, while her son was off to war. When she misplaced it once, she didn’t sleep for two days until it was found. 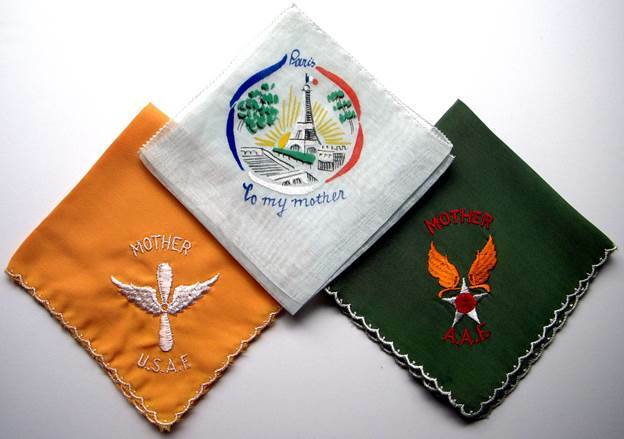 Handkerchiefs gifted to mothers from “fly boys” during WWII. For many of us, our earliest memories of motherhood include snuggling in a warm lap and being read to, by a mother or grandmother, often until we fell asleep. 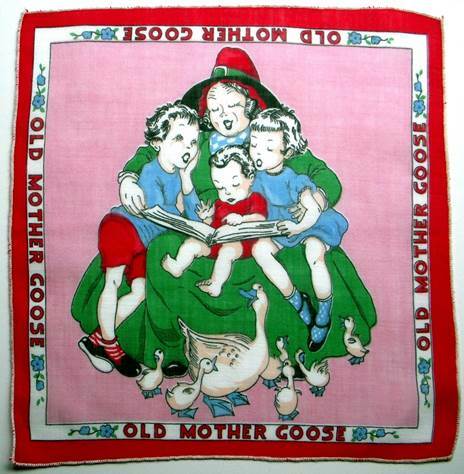 Here, a kindly Old Mother Goose nurtures a brood on her lap and one at her feet! 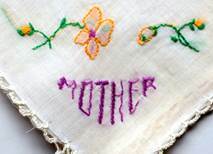 Celebrations honoring spring and maternal goddesses date back to Greek and Roman times, but the more recent history of Mother’s Day dates back to the 1600’s in England when the fourth Sunday of Lent was acknowledged to honor not only the mother of Jesus, but mothers everywhere. The idea for an official celebration in the US was proposed by Julia Ward Howe in 1872. 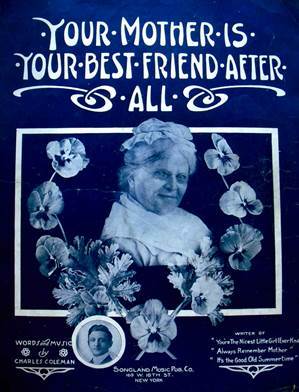 ( If her name sounds familiar, she wrote the words to the famous Civil War song “Battle Hymn of the Republic.”) In the early 1900’s American Anna Jarvis also lobbied those in power to declare an official holiday to honor Mothers. 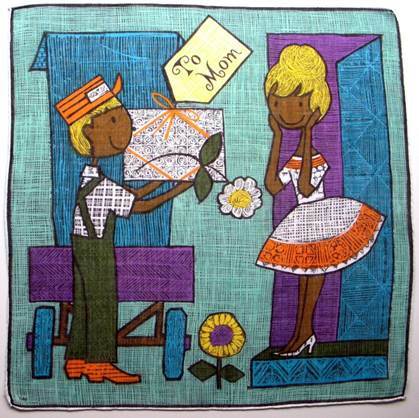 In 1914, President Woodrow Wilson signed a joint resolution designating the second Sunday in May as Mother’s Day. 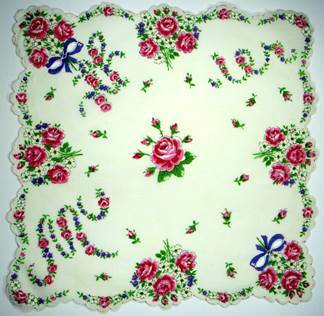 Everyone likes to receive a present that contains a surprise or secret message, and these hankies are just the ticket. 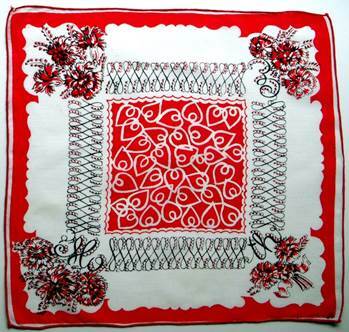 Much like our Valentine hankies in Secret Love, the following handkerchiefs, on first glance, appear to be simple images of flowers intertwined with ribbons. 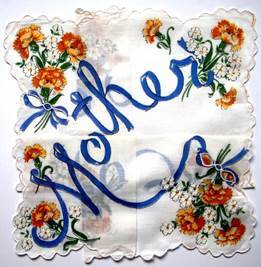 When folded however, the word Mother appears. 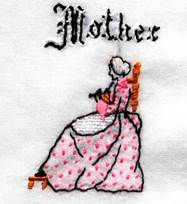 A lady could drape this over her belt, as was the fashion of the day, or let it peek from her breast pocket, and no one would guess she was actually keeping her child close to her heart. “God could not be everywhere, so he created mothers”. 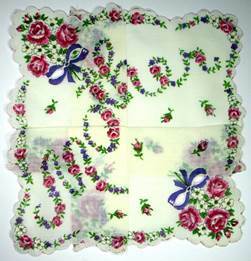 A variation on the ribbon theme, this hankie spells out Mother in flowers. 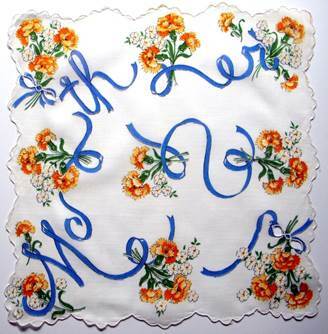 One of the more successful renditions of a secret message handkerchief has the typography truly hidden amidst corner bouquets, appearing like trailing ribbons. The curlicue border assists with the camouflage, while the fanciful jumble of hearts in the center is terrifically modern and fun. 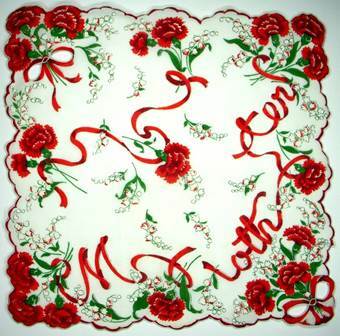 Other hankies aren’t quite so shy. Instead, their colorful message pops right out to say Mom, you’re special. 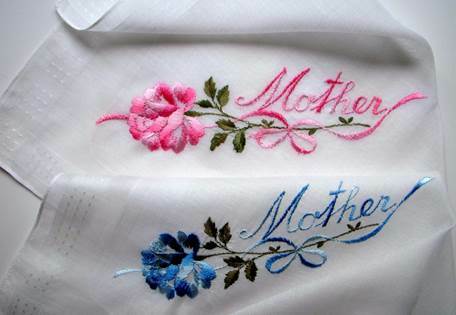 This trio of keepsake hankies all carry roses to mom’s doorstep. 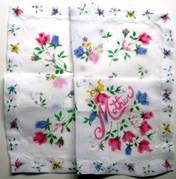 The hankie on the far left is hand painted. 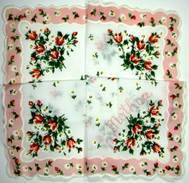 The center pink bordered hankie bestows over six dozen American Beauties to mom, while the roses on the far right are so fragile as to appear almost translucent. 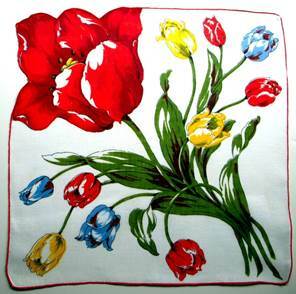 Many handkerchiefs are professionally embroidered, in this instance in ombre threads. 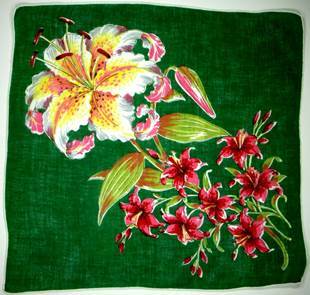 The hankies I particularly treasure however, are the ones embroidered by hand, no matter how crude or simplistic the craftsmanship. Just like the homemade ornaments you hang on the tree, we know each piece was made with love. 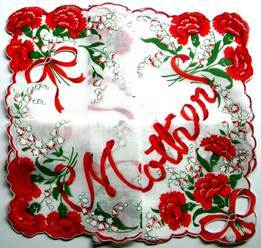 A handkerchief needn’t spell out “Mother” to be appreciated on her special day. These bouquets of spring tulips and lilies, each showcasing a spectacular flower sing “Mom, you stand out from all the rest.” Who wouldn’t love to receive either one? Aren’t they spectacular? Husbands would often gift their wives something for Mother’s Day. 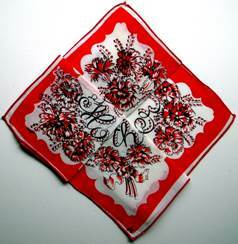 Sometimes, the hankie might indicate what the spouse wished he could bestow, in grateful appreciation for a job well done. 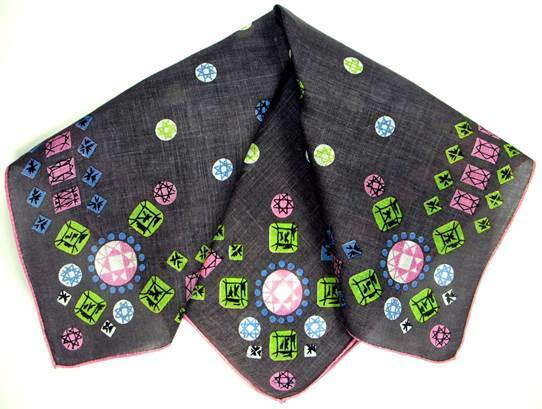 Perhaps a palm full of jewels… This sophisticated gray, pink, lime and ice blue handkerchief captures a pirate’s treasure chest in its folds. It’s absolute perfection. 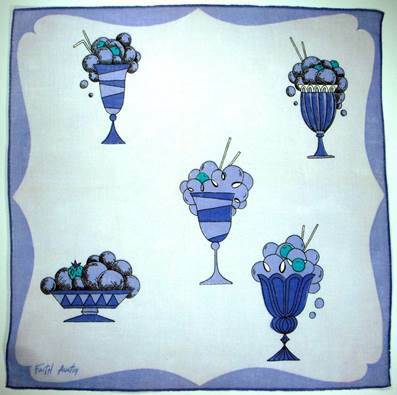 Perhaps the hankie illustrates a special trip taken, or trip to come in the future. 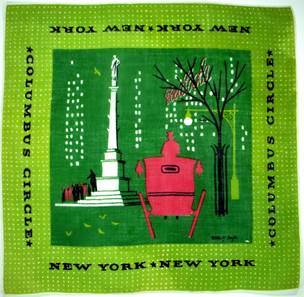 One lucky lady I know whose husband proposed to her in a hansom cab in Central Park, received a handkerchief depicting a carriage ride in the evening, with all the city lights twinkling in the background. Her husband told her given all the women in the word to choose from, he would choose her again, because she was the best mother in the world. When one dad asked his son what he wanted to give his mom for Mother’s Day, he replied without hesitation – Ice Cream! Well why not? Hopefully this Mother’s Day you’ll receive your fondest wish – be it a warm hug or a cold sundae – and you’ll be able to enjoy this day with those you love and cherish and who cherish you in return. 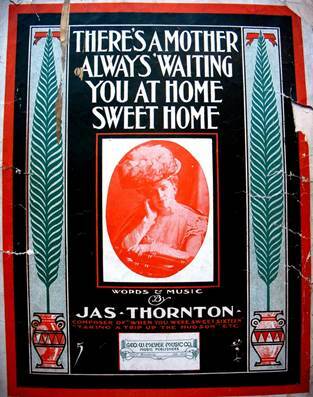 I’m probably going to catch holy heck for this, but I couldn’t resist including this sheet music from 1914, and 1912. The blue photo reminds me of Maude Frickert, a character played by the great comedian Jonathan Winters, whom we lost just last month. Both mothers are quite formidable. A girl who had either one of them for a mother in law would know her place in a hurry. Yessiree. And howdy. 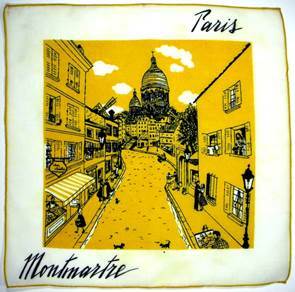 “My mother’s menu consisted of two choices: Take it or leave it”. Written and produced by Kenneth Brian “Babayface” Edmonds, ten time Grammy Award winning R&B musician singer-songwriter and producer. 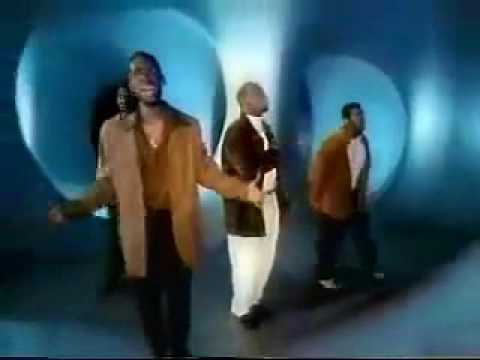 The song was made famous by the group Boyz II Men. Mama you know I love you….